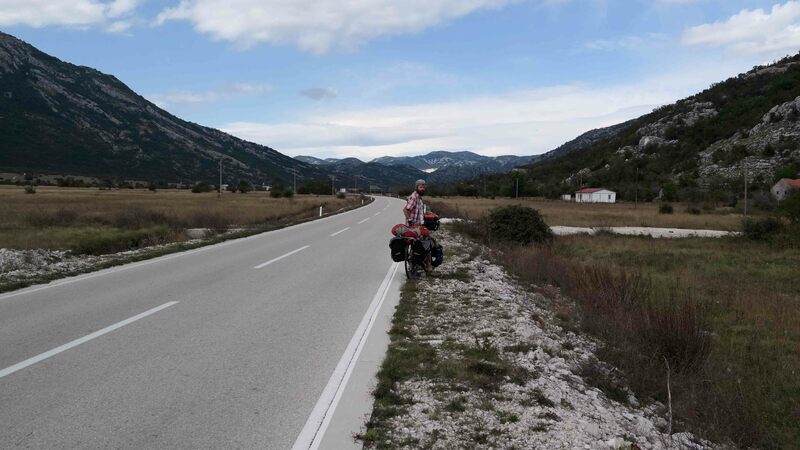 We began our day watching the sun rise across the mountains as we sipped coffee and slurped on noodles that we had wisely tucked away in our panniers way back in Bosnia. As the sun lit up our little campsite, the dew started to dry off and we packed our tent away ready to head to Niksic and onwards. More hills of course ahead of us today and the wind hadn’t taken a hike so we had that to deal with too, but we were starting by losing height and winding our way down to the town for 30km. The road was good and the cycle was easy, presenting us with a beautiful view over Slansko Lake. We took a brief stop to admire the watery expanse, dotted with tiny islands and began the easy, meandering downhill to Niksic. As we pedalled into the town, we noticed an airport where obviously flights are pretty rare, as a guy in an official looking jumpsuit was busy flying a power kite on the runway! The outskirts of the town were very industrial and we thought we would find little to admire there. When we arrived into the centre in search of a Pekara for some life sustaining Burek, we could hear some pretty loud music being played quite close by. As we went to check it out, the first indication that there was something going on was the crowds of people surrounding two horse mounted policemen. The horses obviously aren’t on patrol all that often and absolutely everyone wanted to give them a stroke and take their picture. Further on down the street, there was a big open air stage set up, and the traditional Montenegrin tunes were blaring out. Looking around, we could see lots and lots of children in traditional costume, from the tiniest little ones running around right up to the teenage girls and boys flirting with one another. We were in for a treat! As we filled our bellies, the first group went on stage and began traditional dancing, follwed by another group and then another and then another. It was so impressive, they sang and danced and looked feckin adorable! A little research later revealed that we had happened upon one of Montenegro’s most important cultural festivals. It was really great to see, each kid giving it socks, amazing music and everyone having a great time. At this stage we began debating whether we should tackle our hill for the day or just chill out listening to the music and find a place to stay later. We decided that we needed to get going and headed to the supermarket to fill up on essentials such as popcorn kernels (seriously, they are the best thing) and veg for dinner. And so we started. Passing on the outskirts of town, we noticed a helicopter, and 7 people jumped out of it with parachutes. Seven! How did they all fit in there in the first place!! The first section felt like a drawn out eternity, we passed three campsites, and each one felt like it was calling to us. We wound our way up a small hill to the base of a big climb where we had a coffee at a roadside cafe. One thing we are seing increasingly here is bowls of hard boiled eggs on the tables in cafes. We haven’t figured out if they’re free yet so we have been shy about eating them! After a cuppa, we steeled ourselves to tackle the hills, pep talks were given and off we went. After all our hesitation, some music in helped pass the climb nicely, and despite having left Niksic about 2pm, we made greattime. I’m getting used to this big hills thing, and it’s actually quite enjoyable!! Once again we’ve seen another change of landscape. It’s becoming more rocky and alpine. As we peaked, we had a big downhill ahead. Temperaures have been getting increasingly colder and we had o wrap up to endure the chilly wind at high speeds. On the way down, we stopped at a smallshop and ate a few peanuts in thehope it’s give us the strength fo the last little push and a bit of warmth. We found a perfect little camping spot near Gradac off a gravelly side road and set ourselves up fo the night. Sam seems once againto have found himself a loyal canine friend that watches his every move and wants to protect him from every blade of grass! Another night with a perfect sky full of stars is overhead and we’ve dined well on tuna pasta. Despite the fear we had of this big hill all day, we are in a beautiful peaceful spot. Another day of climbing awaits tomorrowI’m getting used to this mullarkey and it’s great craic!